WSU researchers inoculate young apple trees near Wenatchee. Doctoral student Sarah Kostick is searching for areas of the genome that help apple trees resist the disease. WENATCHEE, Wash. – Apple and pear growers in Washington state recently declared that the spring of 2018 marks one of the worst outbreaks of fire blight in recent history, as noted by Capital Press, an agricultural news publication. Named for the crooked, blackened branches it leaves behind, fire blight can wreck entire Northwest apple orchards in a single season. 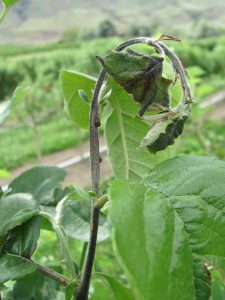 Growers depend on antibiotics to keep the fire blight bacteria, Erwinia amylovora, in check, but the pathogen has already developed resistance in many growing areas. It’s only a matter of time before antibiotics won’t be able to stop it. Sarah Kostick, student researcher at Washington State University’s Tree Fruit Research and Extension Center, is racing against that clock. As she pursues her doctorate in horticulture, Kostick is working in the heart of Washington’s apple country, experimenting with hundreds of apple cultivars in the search for genetic resistance to the devastating disease. An apple shoot curls due to fire blight infection. “Fire blight is one of the few diseases that can cause serious problems for Washington apple growers,” says Kostick. Minor outbreaks strike the state annually, but significant damage was reported in 2015, 2016 and 2017. Nationwide, the disease costs apple growers about $100 million every year. Fire blight prefers to strike at younger, vigorous trees. Older, established varieties, like ‘Red Delicious,’ tend to be more tolerant to fire blight than newer, popular varieties. “We need new apple cultivars that resist fire blight, but keep that high fruit quality,” says Kostick. 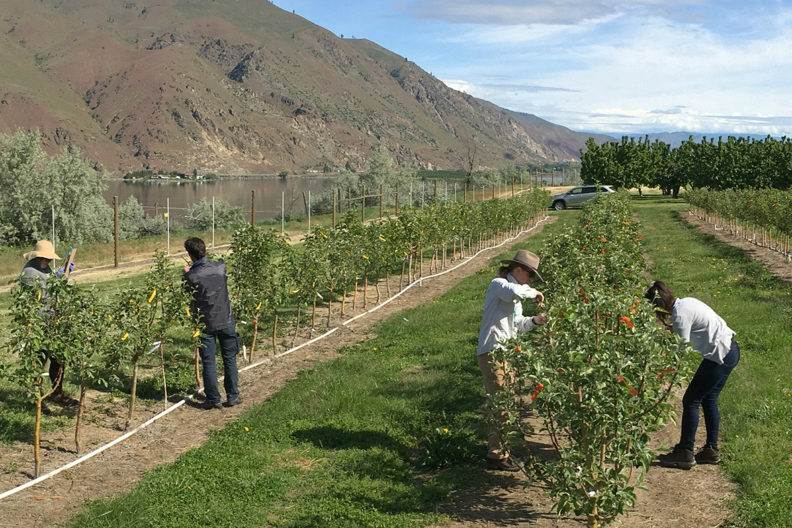 In WSU’s Columbia View Research Orchard, near Wenatchee, she spent the last two years inoculating more than 1,600 trees, from a genetically diverse list of species, with the bacteria. Dipping scissors in a solution of fire blight pathogen, she cut the tips of shoots on young trees, then measured the resulting infection. Kostick is now analyzing the results to find the genes that determine if trees will stand up to the disease. Kostick is a relative newcomer to the apple industry. As a 4-H youth, she was drawn to agriculture and science. 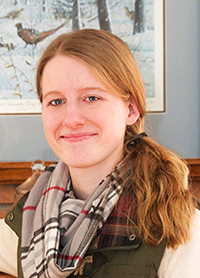 Originally from Minnesota, she learned about apple breeding during an internship at the Minnesota Landscape Arboretum Horticultural Research Center. Master’s degree in hand from the University of Minnesota, she immediately joined WSU researcher Kate Evans’s apple program two years ago. “I love being in the heart of the apple industry,” says Kostick. “I have so many opportunities to talk with growers, share my research and connect with the industry. As an aspiring fruit breeder herself, Kostick is thankful for the opportunity to work directly with growers.